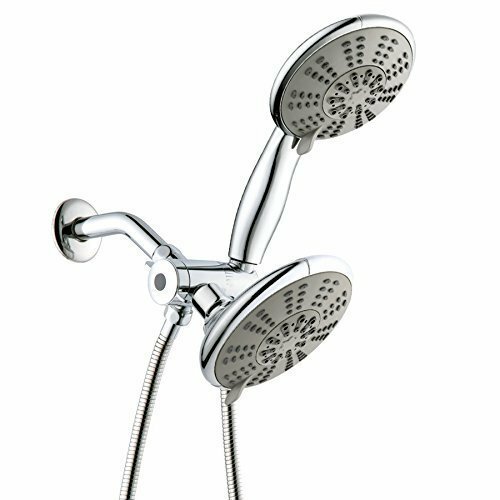 Ana Bath SS5450CCP 5 Inch 5 Function Handheld Shower and Showerhead Combo Shower System is one of the most affordable yet quality showerheads currently in the market. It is extremely versatile with up to five very interesting showering functions. It has many other features that make number one pick for many homeowners who wish to enjoy new functions afforded by their bathrooms. You will learn why people love it. The flow rate is 8.80 liters per minute/2.33 gallons per minute at 80psi. Its big 3-way diverter mount also ensure optimal performance at such high flow pressure. In other words, the showerhead is capable of delivering excellent water pressure. This unit is designed to use less water than the conventional showerheads currently in the market. Its chrome plated finish gives it an elegant and sophisticated touch that only matches most luxurious bathrooms. It comes with a 60-inch stainless steel hose that is long enough to allow maneuverability without restrictions. In a nutshell, the design is intelligent and practical. The entire fixture is designed to work very quietly. Do not fear incurring more costs as installing this showerhead and handheld combo is a wash in the park. All you need is to know what goes where and the process will end successfully in just minutes. There is no need for any sophisticated plumbing tools to complete the process. The good news is that each unit comes packaged with a user manual containing easy to understand instructions on installation, use, care and maintenance of the showerhead. You can enjoy a wonderful showering experience thanks to the 5 function settings offered by the showerhead. It is extremely easy to install. You do not require any tools to do the job. Its 60-inch stainless steel hose capable of delivering water at high pressures at the best flow rates. It is very quiet while operating meaning you will not disturb the peace of others as you bath. This bathroom fixture is designed to enhance the aesthetics of your bathroom. Most parts of Ana Bath SS5450CCP are made of plastic, which may reduce its longevity. Some people claim that the diverter valve is failed after a short period of operation. If you have been looking to install a new showerhead/handheld shower combo then Ana Bath SS5450CCP is a great choice. You will love its 5- function shower patters as well as other great features that promote its performance. Its installation process is extremely easy, quick and tool-less. Its elegant, exotic design also makes it a great choice for those wishing to give their bathrooms a luxurious touch.